Editor's note: Much ado has been made of how terrible the transfer is of Santana's "Abraxas" to multi-channel. Who's responsible.....David Frangioni.What's he doing now? Apparently; he's running a string of installation outfits outfitting the stars and super rich with home theaters and home studios. I wonder if he uses his own copy of "Abraxas" to calibrate his installations....lol...?! "Founded by David Frangioni in 1985, Audio One has earned a reputation as the most innovative team of professionals in the audio & video industry. David Frangioni co-produced/engineered the first 5.1 digital surround sound music mixes ever on CD for DTS in 1995. He also co-produced two of the best selling Sample CD's of all-time (Dance/Industrial I & II) released in 1991 & 1994, respectively. David released his 3rd Sample CD, "Steve Smith - Rhythmic Journey" in 1999 and his fourth and latest Sample CD, "More than Styx" in December, 2002. Recipient of over 65 Gold and Platinum albums as technical consultant, engineer, and/or programmer since 1987. Featured many times in over 55 different magazines worldwide since 1988. 17+ years of experience & knowledge. Trust the professionals. Trust Audio One. David Frangioni co-produced/engineered the first 5.1 digital surround sound music mixes ever on CD featuring Boyz-II-Men, Seal, & Shoeless Joe (for DTS) in 1995. From there, he went onto mix over 50 DVD titles into 5.1 surround sound. David has mixed such legendary DVD releases as "Amnesty International: The Paris Concert," "Kiss; The Second Coming," and "MTV Superstars Unplugged." His mixes have received stellar reviews from the audiophile and videophile press. Utilizing the latest in surround sound technology, Audio One studios features the all state-of-the-art equipment for producing impeccable, well-balanced, surround sound mixes. In fact, David Frangioni has patented a unique technique for creating 6 channel surround mixes from 2 channel sources enabling literally ANY stereo soundtrack to be released onto DVD with a 6 channel mix! If you're serious about the sound of your surround sound project, call the experts, call Audio One." Santana is awesome and Abraxas is one of a handful of my all-time favorite albums. On hearing of this dts release, I immediately ordered it. What a disappointment! The separation of instuments and parts is terrific, but all the punch and soul of the music is missing from the bass and lower percussion. This is a stereo album/CD that you can rock to. The dts version is interesting but lifeless. It sounds to me like the engineer who mixed this may have misdirected some of the main parts to the rear channels (which on most systems are set at lower volume levels) and simply forgot to include the bass or to punch the bass for dts. The center channel frequently is quiet instead of maybe sharing the main instrumentation or vocals with another channel. Anyway, the result is an unfortunate mix that leaves this listener wondering if they really spent much time on the project. Did anyone at the studio actually listen to this before they released it? I think I'm being generous with 3 stars; if it hadn't been THIS album I'd have given it one star. Okay, my turn to chime in. For me, this is multi-channel (SACD, DVD-AUDIO or DTS) disc number 72 for me. I purchased the re-packaged (long, slim jewel case) DTS CD and popped it into my player. I do not have the 2 channel SACD to use for comparison but I do have the regular remastered CD. This mix presents a wildly un-musical, psychedelic=like four channel guitar panning, throwing Carlos' guitar solos all over the place. In is a little unsettling. But the first thing you will notice on BLACK MAGIC WOMAN is that the .1 channel is almost non-existent. Gone is the wonderfully fat bass line, especially those G's (G1 on your piano keyboard). Also gone is the low thump of the bass drum. It's like listening to Santana perform and having the bassist playing about 20 feet behind them with his amp turned down really low. I had to crank my Velodyne WAAAAY up to match the SPLs of the 2 channel CD. Although the timbre of the instruments is really top notch on this release, Abraxas deserved a much better remastering than it received here. In my own opinion, this release and Wings' VENUS & MARS are DTS' worst 5.1 CDs on the market. 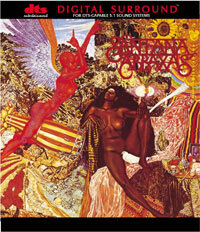 Santana’s "Abraxas" was available in DTS High Definition Surround Sound, (HDS 7102154434-2). This premium recording cost $25. It better be great! I have the Original Master Recording CD (UDCD 552) of this disc so I was able to compare them directly. The DTS version of this great recording was worse than anything I could have imagined! The rear channels were too loud, they tended to breath louder and lower, the equalization was even more radical, and the instruments and vocals were all over the place. Where the chimes on "Singing Winds, Crying Beasts" were clear, and stood out realistically in 3-dimensional space on the original version, they crashed, sizzled and were all over the place on the DTS version. The guitar no longer carried its note through the audience in the opening. It was thin and without body. What was going on here?